Available in variety of shapes, curves, styles, designs and colors, our wedding mandaps and wedding tent are highly spacious, durable, attractive and cost effective. Our Garden Wedding Tent and Wedding Mandaps are easy to maintain, these structures are designed to withstand the weather conditions and can be equipped with custom designed furnishings, carpeting and more. We are a well-renowned organization in the industry to provide our patrons the best quality array of Modern Wedding Mandap. Backed by profound experience of our experts, we are an unparalleled name engaged in providing the high-quality assortment of Royal Wedding Mandap. From our broad variety of products, we present handpicked quality of Jodha Mandap to our admired patrons. We are a unique entity in the industry, actively committed to offering an optimum quality range of Wedding Mandap. 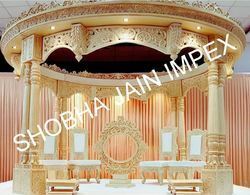 Being the foremost names of the industry, we are involved in providing an extensive range of Marble Mandap.